Physics is the branch of science that involves the study of the physical world: energy, matter, and how they are related. Topics that are discussed in this course include 1 and 2-Dimensional Motion, Vectors, Forces & the Laws of Motion, Work & Energy, Momentum & Collisions, Circular Motion & Gravitation, and Vibrations & Waves, and how these principles affect our society and the world as a whole. A knowledge and understanding of the principles of physics not only leads to a profound understanding of the physical world, but also supplies the student with the insight to develop new and innovative ideas. Applied Biology-Chemistry 1 is a discovery-based, hands-on science course that consists of units which integrate biological and chemical concepts, including Ecology, Cells, Heredity, Evolution, and Chemical Interactions, to prepare students for future courses in biology and chemistry. Open-ended questions and problem-solving techniques covered in this class allow for the development of logic and consequential thinking skills. Discussion and resolution of real world scientific issues will provide students with the problem solving skills required in a 21st Century, technologically advanced society. Applied Biology-Chemistry 2 is a senior course that investigates the structure and function of the human body. Topics covered will include the basic organization of the body and major body systems along with the impact of diseases on certain systems. Students will be exposed to various methods of learning: lectures, discussions, cooperative learning, videos, lab experiments, group projects, and many hands-on opportunities will be provided, with formal quizzes and assessments. Instructional methods incorporated are diverse and catered towards students of many different learning styles. Principles of Technology I is a course designed to prepare students more effectively for a technical career. The complexity and rapid change in modern technology requires training that is applicable to more than a single job. Technicians must understand the mechanical, fluid, electrical and thermal principles on which modern equipment operate. In the first year, students are introduced to force, work, rate, resistance, energy, power and momentum. Principles of Technology is a course designed to prepare students more effectively for a technical career. The complexity and rapid change in modern technology requires training that is applicable to more than a single job. Technicians must understand the mechanical, fluid, electrical, and thermal principles on which modern equipment operates. It is an academically rigorous and practical course incorporating simple to complex technological devices and equipment as well as the mathematics necessary to understand the principles covered. Units of study include Force, Work, Rate, Resistance, and Energy. Chemistry is the study of materials, their composition, structure, and the changes they undergo. It is an experimental and intellectual course geared toward problem solving and the development of analytical thinking skills. Understanding and appreciating the environment and recognizing the order in nature are some of the goals for each student. Topics that will be studied in this course include: Matter & Energy, Atomic Structure, Nuclear Chemistry, Elements & the Periodic Table, Chemical Bonding, Formula Writing, and Writing & Balancing Chemical Equations. Chemistry is the study of materials, their composition, structure, and the changes they undergo. It is an experimental and intellectual course geared toward problem solving and the development of analytical thinking skills. Understanding and appreciating the environment and recognizing the order in nature are some of the goals for each student. 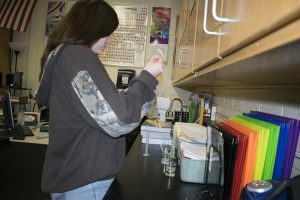 In Honors Chemistry, the same topics in general Chemistry will be studied; however, students are expected to delve into the material in greater depth and in a shorter amount of time. Biology is an academically rigorous sophomore science course that explores all of the major principles of the study of living organisms. The main topics of study include Biological Principles, Cell Biology, Biochemistry, Evolution, and Genetics. Students will be exposed to various methods of learning: lectures, discussions, cooperative learning, videos, lab experiments, group projects, and many hands-on opportunities will be provided, with formal quizzes and assessments. Instructional methods incorporated are diverse and catered towards students of many different learning styles. Honors Biology is an academically rigorous sophomore science course that explores all of the major principles of the study of living organisms. The main topics of study include Biological Principles, Cell Biology, Biochemistry, Evolution, and Genetics. Students will be exposed to various methods of learning: lectures, discussions, cooperative learning, videos, lab experiments, group projects, and many hands-on opportunities will be provided, with formal quizzes and assessments. Instructional methods incorporated are diverse and catered towards students of many different learning styles. 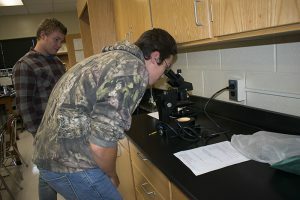 While the same general biological concepts of general Biology are covered, students in Honors Biology will be expected to delve into the material in greater depth and in shorter amount of time. There is an increase in student centered instruction such as debates and research projects.